Well we are in the last week of March and the weather is really picking up but at the same time having a few low points. Thursday and Friday were glorious days of sun with light breezes and temperatures between 15 and 18 degrees. Saturday took a turn for the worst with overcast skies and cold easterly winds..temperatures about 6 degrees. Sunday was still overcast but the winds were lighter and warmer of a southerly direction, temperatures about 12 degrees. A very sharp overnight frost. Monday started out foggy and frosty but did warm up to reach 13 degrees. Tuesday bright and airy with warm sun and light breezes. Temperatures of 15 degrees with some overnight rain. Then toady was another cold spell with some cold winds. Temperatures of 6 degrees and rain in the afternoon..mustn't complain about the rain though...it will make weekend planting easier!! There's always a learning curve!! Well I know I promised you some pictures of my fabulous seed germination but they aren't going to happen in this post. 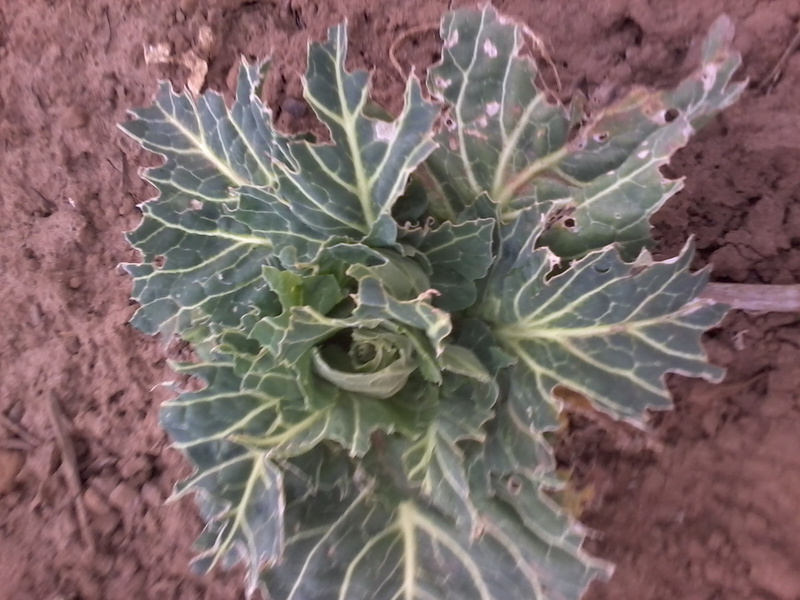 I have never grown winter greens before but with my disasters on brassicas last year I decided I would give it a go and even with the harsh winter they were doing extremely well, that is until this last week or so. As you can see above the visitors have been feasting on them so there isn't mush left for us. I think it may be pigeons...or even rabbits! It isn't a total loss though as they have only attacked those on plot 15....why I don't know, I'm just grateful to have some left for us!! 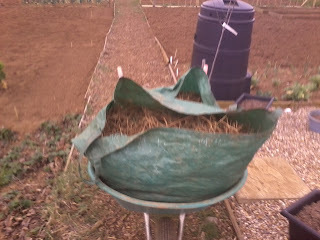 So the learning curve for the winter veggies is to make sure I net them so the wildlife can't get to them before we do. This hasn't put me off growing them at all, I will just make sure I protect them next year!! Twitch...you either hate it.....or....well....HATE it!!!! Well I spent the weekend digging the rest of the twitch out of the new plot I was given last year. 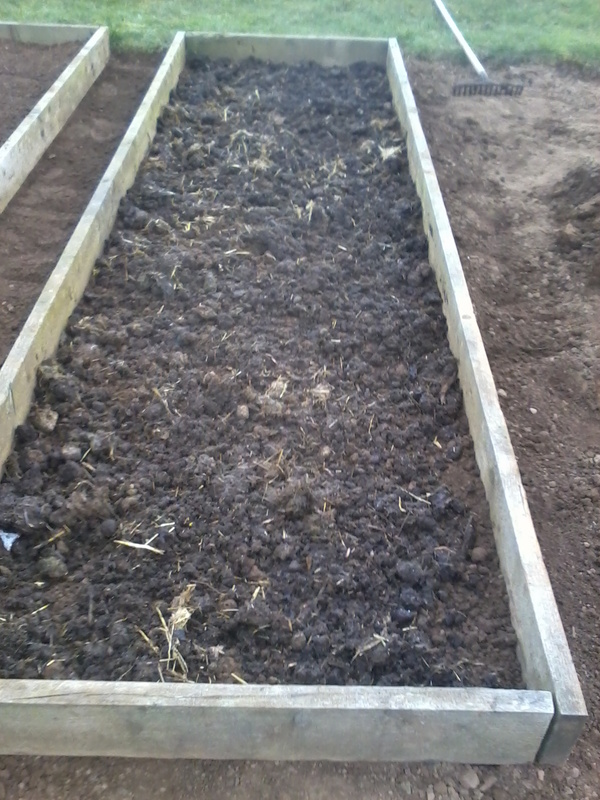 There was only half left but it was still hard going but such a relief to have dug it all over and out. I have two huge bags of the stuff and although I know there will be little bits I have missed these will be easy to dig out as they rear their ugly heads over the summer. I have to admit to having a little help with the twitch removal and I certainly wasn't going to pass on the offer....now all my allotment is ready for planting out and hopeful this week I will be getting some potatoes and onions in the ground. I read my crop rotation wrong so the raised beds aren't in the place I wanted them for the crops but I will tell you more about that in another post. 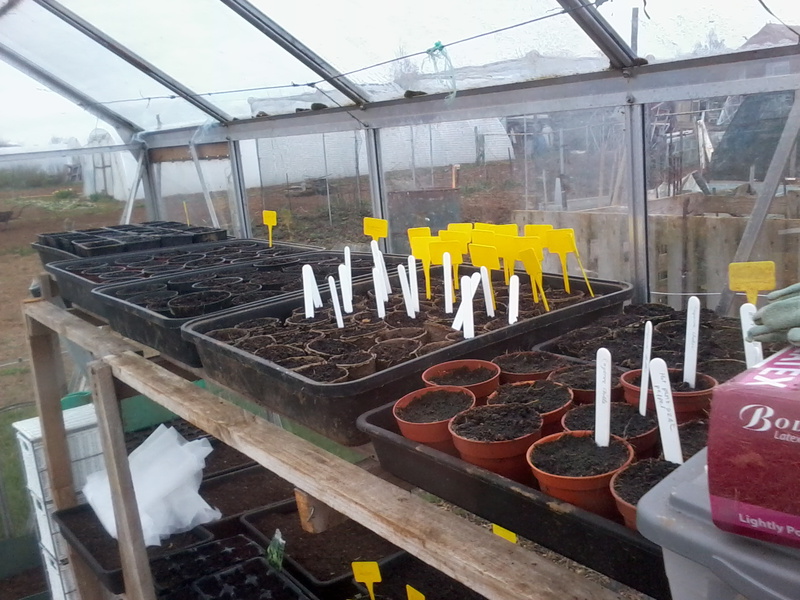 I have had some germination success in the greenhouse which is very pleasing but I haven't took any photos yet but promise you a picture post tomorrow...but I can tell you now that so far I have 12 parsnips germinated....after just one last year and none the years prior to that you can imagine my elation!!! Well the last week the weather has been glorious. Warm days with temperatures ranging between 15 and 19 degrees and mild evenings of 7-10 degrees. We had a light shower on Sunday for about 20 minutes but apart from that no rain. The light breezes have been refreshing whilst outside and it's been nice not to have to cover the seeds every night. The lack of rain has had a few people watering their allotments though which really grieves me as although the top of the ground is dry there is plenty of moisture beneath and the last thing we need to be doing is watering the garden in March!!! Hope you have all had nice weather too...British Summer technically begins on Sunday with the moving of the clocks so it's bound to turn cold next week!! Has anybody heard as to whether we move the clocks one or two hours yet?? I know there was talk of a two hour move last month to give us lighter nights and attract more tourists to the country but I haven't heard anything recently. Well it's been a hive of activity down the allotments over the last few days and believe or not some of that activity came from me too!! I have been quite busy over the past few days getting some gardening done and also cutting a neighbours fern trees down by a few feet in the blazing sun...yes you read it right I did say 'blazing' sun...and just as well really as the clocks are to be moved this weekend which officially is the start of the British summer!! The weather has definitely turned around for us but more about that in tomorrows weather watch. I have been meaning to post for a while but have been so tired in the evenings I haven't even turned on the computer so I am hoping to catch up with everyone's blogs tomorrow. Tonight I am sleepy after another busy day so just thought I would share with you a few pictures of what I have been up to. 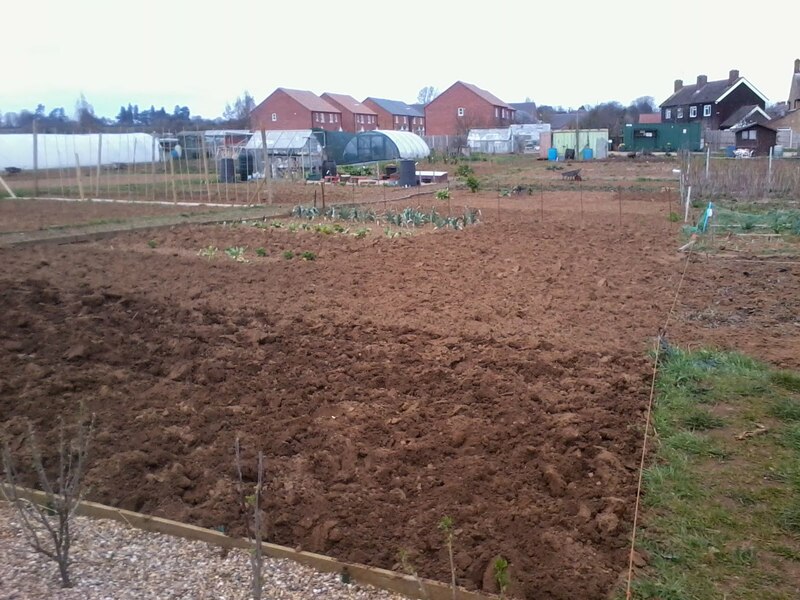 One half of the allotment has been turned and is ready for tilling and planting. 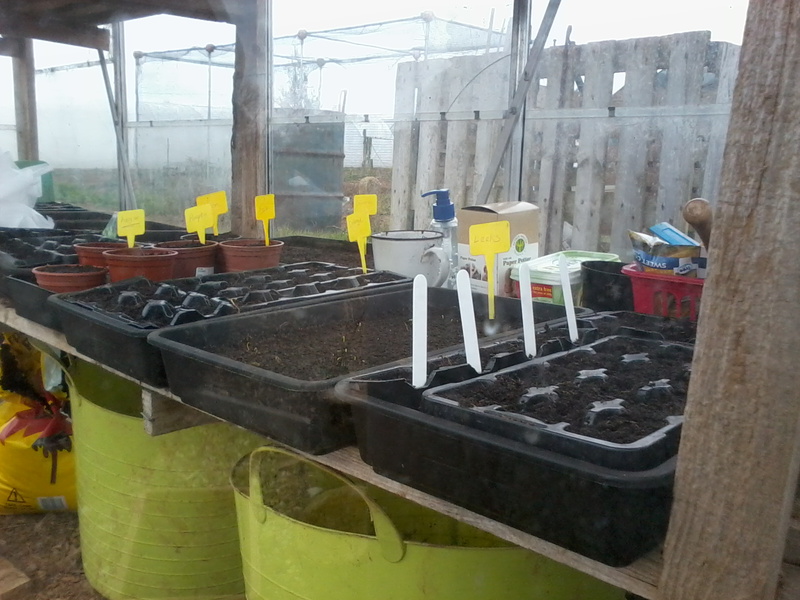 Plenty of seeds have been sown in the greenhouse! I'll tell you about all the different varieties in another post soon. The trees are blossoming nicely...all except the Cherry tree which it seems has died over the winter and will need to be replaced. I hope you are all managing to have some fun in the fresh outdoor air too. Well the weather for the last week has been quite varied. Thursday...temps high 7 low 3 degrees...winds 60mph..sunny, showery and cloudy. Friday......temps high 10 low 7 degrees. Winds 30mph...Sunny. Saturday....temps, high 11 low 8 degrees. winds 23mph.....cloudy. Sunday....temps, high 12 low 0 degrees. light winds, rainy. Monday...temps, high 10 low 6 degrees, light winds.....sunny. Tuesday....temps, high 8 low 7 degrees...thick fog. In light of the gloomy weather I thought I would share with you some of the colour from my rockery!! 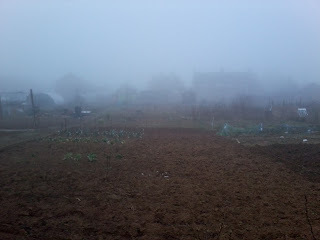 Allotment happenings over the last few days. Well I have been up the allotment for a few short spells over the last few days but not got around to telling you all about it so I figured I could do it all in one post!! First visit was Saturday..this wasn't really to get anything done but primarily to release the toads and frog that we have had over winter in a tank at home. Of course we released them into our new pond and they were very happy once lowered in the water to get their first good swim for a while and then soon dove to the bottom of the boat...erm I mean pond!! One of the toads relishing it's new home. 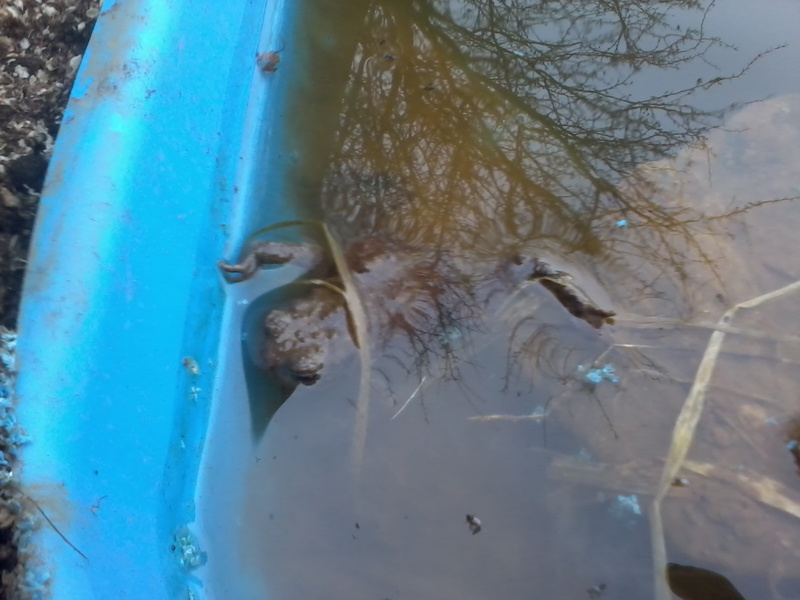 My nephew came with me to release the toads..he was happy to do this after keeping a watchful eye on them over the winter as he thought they deserved to be set free and was happy to see them swimming freely. The pond get's approval from my youngest nephew! 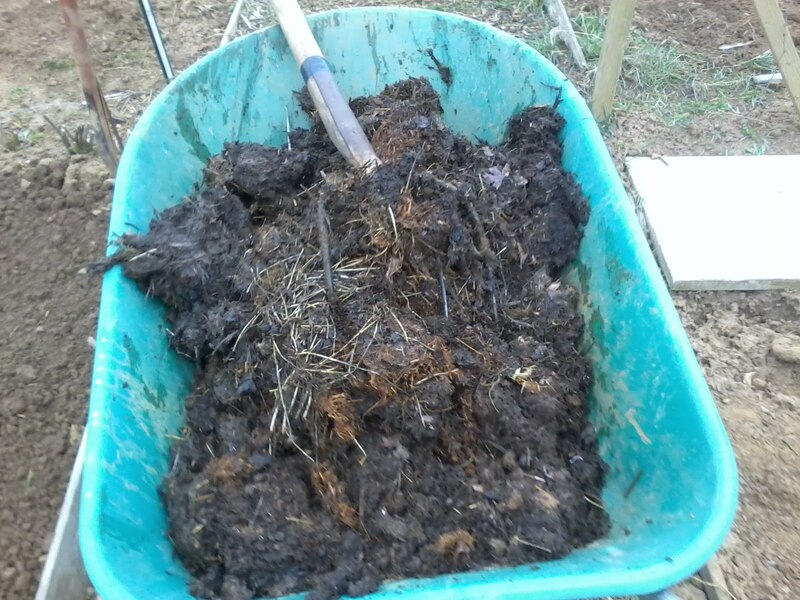 I also got the new shipment of manure sorted and then called it a day as although it was nice I really needed to get a bath after moving the manure...it was VERY fresh..poooie!! The I went up the allotment on Monday but only to dog a lettuce out of the greenhouse...we needed it as we had devoured all that was left in the fridge!! The last over-wintering lettuce from the greenhouse...now it will have to be store bought stuff..but hopefully not for too long! 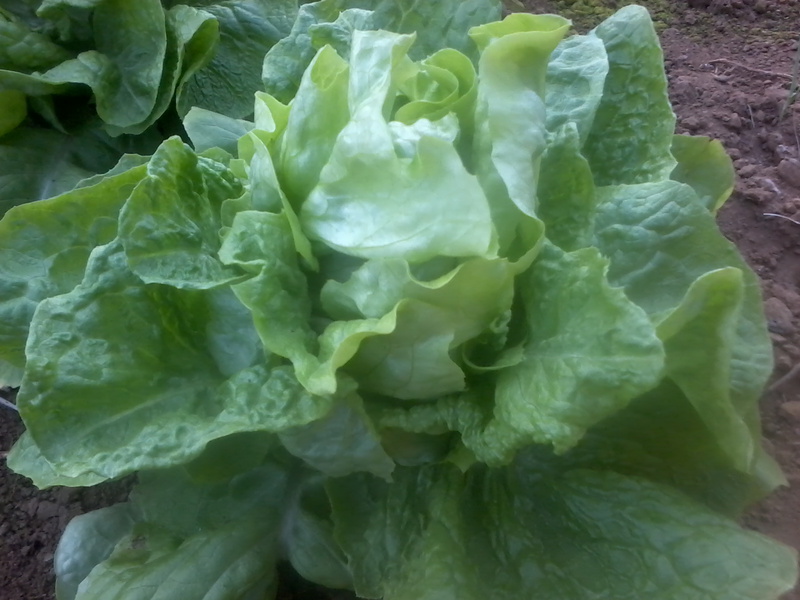 That was the last lettuce...I would have had enough for a few more weeks if I hadn't lost some over the winter but I am quite pleased with the amount that managed to fight against the cold! Then this morning I was up bright and early, (even if the morning wasn't the same!!) 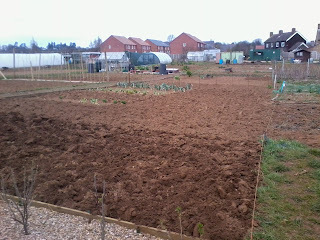 so I decided I would take an early visit to the allotment and get a little digging done. It was all dug over last year but it is getting quite dry in the ground so I figured there was no harm giving it a turn with the spade just to loosen it a little to make future digging and planting a little less back breaking! As you can see from the picture above it wasn't the most inviting of mornings but I actually really enjoyed the solitude that the fog and the early hour gave me..it was so peaceful out there with not a soul about and I really got a lot done in the short while I was there...I'm hoping to go up tomorrow and get a little more done..I figure a little time each day will soon get it all sorted!! Hot beds on the allotment. You may remember a while ago about me mentioning the raised beds I had gotten hold of and that I had a specific purpose for them that I would tell you about at a later date. Well today is the day you find out...but I thought I would do this post mostly in pictures after a brief explanation! The beds are going to be used as movable hotbeds. I want to be able to move them around each year for crop rotation (more about that in another post!) as I always plan (if this year goes well anyway!) to have my squash plants in them as 'apparently' they love to grow in hot beds!! 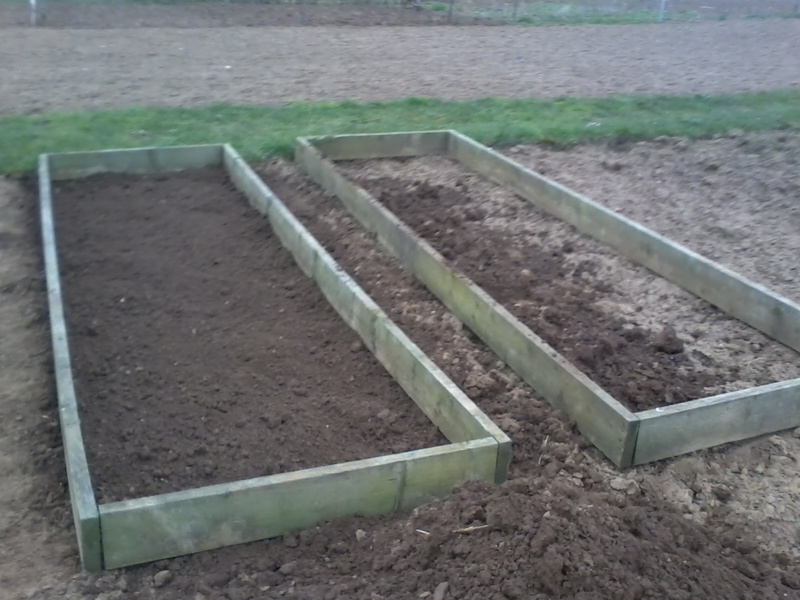 Firstly the beds were moved to their correct location and then the earth dug down and over so they were level. 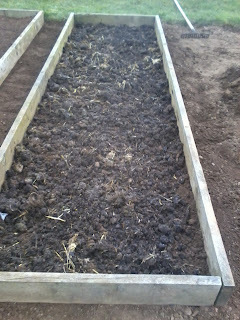 Next, a couple of barrow-loads of rich manure was put into the beds and spread...well more or less evenly! After this then a good layer of soil was put on top of the manure and that's it...done!! The beds are now ready for the courgettes, marrows, pumpkins and cucumbers to go in in the next month or so. I'm excited to see how this affects their growth! 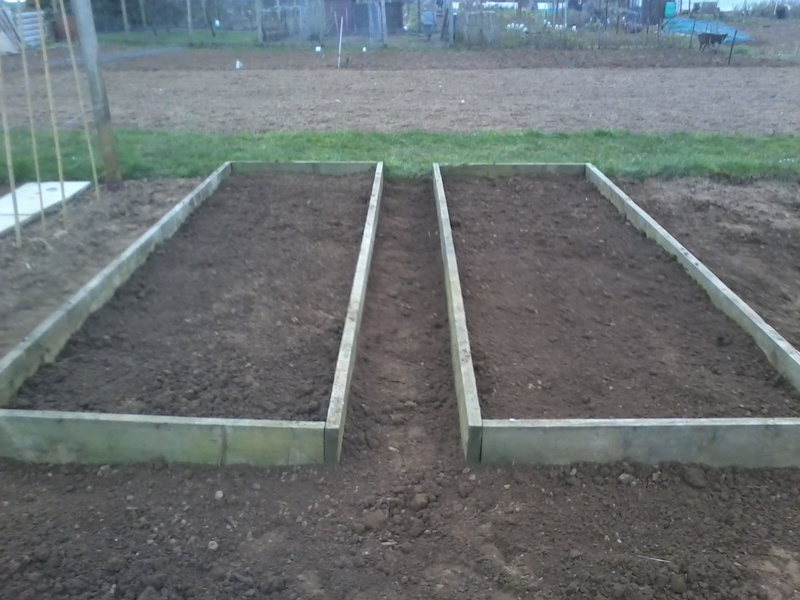 So that was how I spent my few hours on the allotment today. It was quite a hive of activity today with the mild temperatures and the wind having dropped a little. 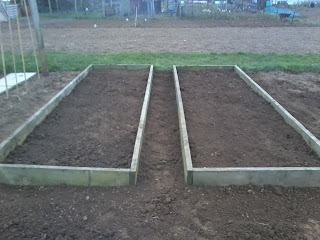 Kate was their and get plenty of her plot dug over and manured and also planted some shallots and broad beans. Also saw quite a few others coming and going all trying to get a head start before the mad planting rush!! Hopefully it shouldn't be long now before the potatoes can go in!! Well I know I'm a day late with this post, and there is no allotment news to go along with it but I hope you will all forgive me!! The weather has warmed up slighly and there is a definite improvement in the length of the days. We are still getting those nasty winds at times but they have turned to a more southerly direction which makes them a little more bearable than the north-easterly winds we were getting. Temps between 5 and 9 degrees. Rained only 3 out of the 7 days and some occasionally bright clear skies have lifted my spirits and warmed the conservatory and greenhouse up to 28 degrees at times. When last check there were no signs of life as yet in the greenhouse!!! Well all I seem to be doing lately is making quick trips to the allotment. My Mum gave me a couple of planters she didn't want so I popped down the allotment and added them to those already on the gravel and filled them do they are ready as soon as the weather is warm enough for me to put seeds in. I also sowed some Aubergine seeds as Jo over at The good Life told me that they too need a long germination time...thanks for the tip Jo. Apart from that not much is really happening on the plot at the minute though we have had a few dry days and I am hoping it keeps up so that I can get those raised beds I told you about a while ago in place and sorted for there future plan!! Been gardening today...it was nice to see so much activity and I also saw some frogs out of hibernation and heading for the pond...not mine unfortunately but I will be releasing the ones I have in the tank this weekend. I sowed a few petunia seeds around the pond and got a couple of cabbages for dinner!! After tea the lawn got it's first haircut of the year...Yay...Spring really has arrived!! Oh and totally unrelated...allotment4you has now officially got 100 followers and has more than 250 posts...hope you are all still enjoying reading my sometimes whiny, sometimes mundane and occasionally funny posts!! I would just like to take this opportunity to thanks you all for stopping by. 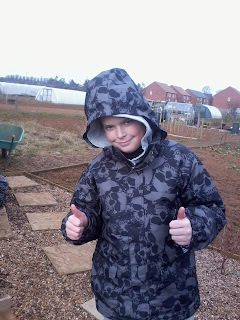 Quickest allotment visit in history!! I made the quickest trip to the allotment in history on Thursday afternoon when I popped up to get some hormone rooting powder. That was actually the only thing I intended to do but i did check on the seeds whilst I was there, no growth happening but I didn't expect any after a few days but wanted to check that they were damp. I needed the rooting powder to try and save a cactus plant. My nephew bought some cacti last year and the Lincolnshire Show and one was looking very poorly and withered so after a little reading I have doctored it...added some rooting powder to an extra 'leaf' and now we just have to hope for the best! The cactus looking a lot healthier...now we just have to wait! Friday was a busy day for me but again not on the allotment. I decided I would make a lasagna for teat...I made everything from scratch but the pasta which I bought in the store. This used up the last jar of sauce I made last year out of my tomatoes so no more totally home made sauce will be used for a while.....I am really sad that all my home-grown home made stocks are depleting so quick :-( .......it will be back to tinned tomatoes as they taste better than the tomatoes the store is stocking at the moment!! The Lasagna filling...I meant to take a picture of it all put together but forgot...I was quite pleased with it and It must have gone down well as everyone cleared their plates! Yesterday was also Kate's (my allotment neighbour) Birthday. we had arranged to go up with her partner but Kate knew nothing of this so it was a total surprise when we turned up with a card, a bottle and a homemade birthday cake. This post was originally meant for yesterday but a we didn't get home until nearly 1am I figured it could wait a few more hours. So how are your stocks from last years allotment produce holding out?? I think I definitely have more stocks for next winter!! Well I have a few things that I thought I could improve on for the next growing season...which is now the one that is rapidly meeting us so I thought I would share them with you. Firstly I found that my Aubergine didn't do any good at all and that is probably because it was too cold so this year I will try again but plant it in the greenhouse. My Grapevines have been moved to a permanent place outside of the greenhouse, I was worried about doing this initially but someone with vines a few plots over gets a good bunch off theirs so I have put mine up as a border between mine and the next plot with a good fencing structure for support...now only time will tell. I had a great crop of runner beans last year as always but my fencing system was a little off as I didn't have enough upright posts and the beans all trailed along the bottom wire and climbed together around the main posts which whilst not being a problem for the beans themselves made them very difficult to pick and lots were missed. I have now put in plenty of upright poles to hopefully combat this problem and I have also put a row of slabs along the fence to make harvesting a little cleaner...I can spend quite a lot of time looking for my beans and I thought this would make it a little easier. I will also plant them the other side of the fence this year so as not to disturb the crops so much that are planted in front of them! The improved bean fence with the path in place! Lots more pots have been bought for the gravel area around the greenhouse and this is going to be 'The Salad Bar'. All of my salad is going to go here...firstly as it will help prevent slug and snail damage and secondly as it means no matter how wet it is I will be easily able to harvest only what I need as they will be easily accessible and I do prefer my salad 'just picked'. I am going to grow some baby carrots in these tubs too. 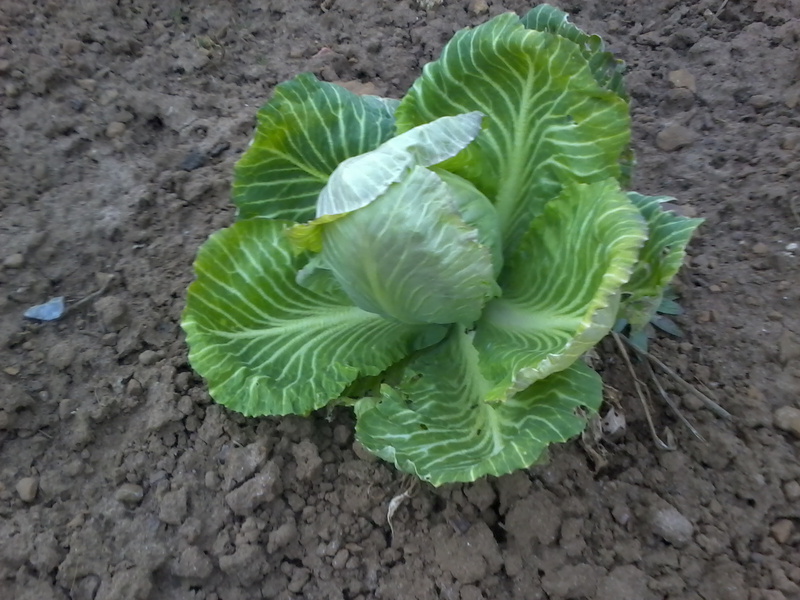 The only salad that will go into the plot will be my beetroot. I am hoping for more success with my parsnips this year and so I have sown them into peat pots in the greenhouse to be planted out if they come through...every year so far I have wasted space by planting them directly into the ground...I have also tried 'chitting' them first without much success...this way if nothing happens with the seeds then I won't have wasted the space on the allotment. I have planted all my Pepper seeds into pots covered with fleece in the greenhouse. Although I have always had peppers it has never been a great harvest and I am hoping that by sowing a little earlier I will be in with the chance of a better crop. Oh and I am definitely more organised this year. I have all my seeds sorted and everything is looking good...I am even planning ahead for where stuff will go and I hope that this along with all my other new quirks and strategies will give me an excellent season ahead!! So what improvements have you made for 2011?? Or are you just that great that you didn't have to make nay tweaks this year? Well we don't seem to have been in 2011 for more than five minutes and already its March!! The weather has been cold....VERY COLD...at least that's what it feels like since I came home at the weekend...who'd have thought it would actually be warmer on the beach then inland?!?!?! So temperatures have been between 3 and 7 degrees and I haven't seen the sun since I left the coast at the weekend. There has been quite a lot of rain but just the mizzly stuff. Today actually stayed dry!! The garden is slowly coming back to life and I have primroses, pansies, crocus and heathers in flower...my daffodils are nearly there too!! Been down the allotment and got in some Pepper seeds of various varieties, parsnip in peat pots and leeks. 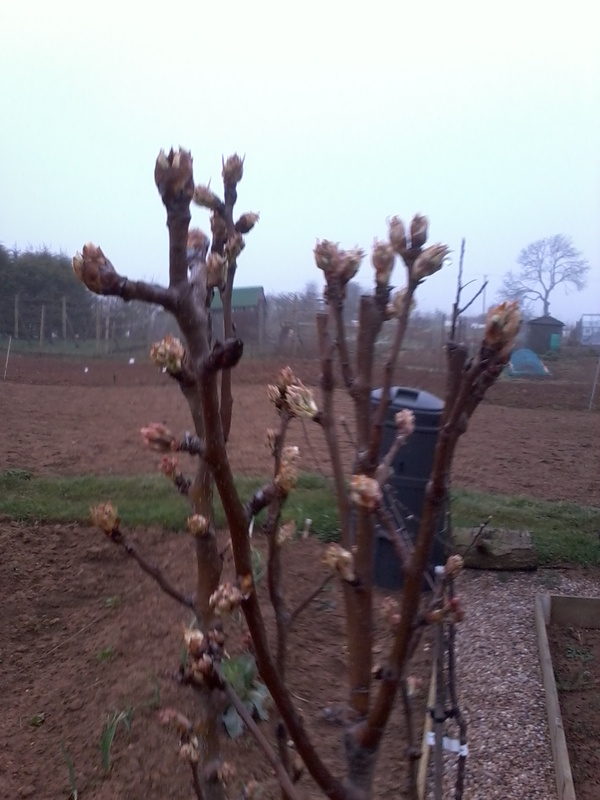 Now we just have to wait a little longer to get the spuds in the ground! !